The eponymous single from Jesse Jerome Jenkins V’s solo debut Hard Sky is a mesmerizing cut of soft rock and it’s just been given an equally spellbinding video to match. As a member of Pure X since 2009, Jesse’s solo debut was always going to have an audience, and that audience was not disappointed. The whole album was self-recorded, with almost all of the instrumentals provided by Jesse himself, and the closing track ‘Hard Sky’ is an emotional, nostalgic, hazy highlight. The track gives off a tranquil mood, laid out by a concoction of synths, delicate drumming, and guitar leads that are best suited played under open skies. Traces of jazz tones can be found underneath it all. Jesse’s voice is the cherry on top, delivering heartfelt lines in a wistful croon, making it seem like lazy work. Lyrically, messages of connection alongside messages of defeat combine to create a pretty special atmosphere. 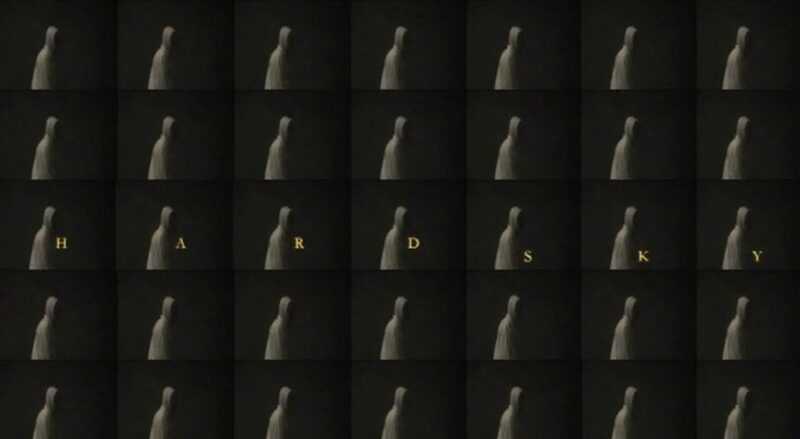 The new video, created by filmmaker Conor Rollins, adds to the out-of-body feel of the track, mixing different clips and cuts of footage across a black background before focussing in on one anonymous character in a white hoodie, with spellbinding effect. The montage has been carefully lined up so that the images correspond to certain parts of the song, and we think you’ll find yourself watching it a few times to spot new details. We caught up with Jesse to learn more about the song, the video, and his plans for the future. TJ: Hey Jesse, tell us a little bit about yourself. J: I’m Jesse Jerome Jenkins, V. I'm 34 yearsrs old. I live and work in Corpus Christi, Texas with my wife, the artist Ashley Thomas, and our cats Dusty and Cecil. ‘Hard Sky’ is an entrancing track. What’s the story behind it? As far as the groove and delivery, it's my very slow and primitive take on a funk song - I was obsessed with Superior Elevation at the time. Lyrically it's about the unexpected death of a friend. I jotted down a quick instrumental demo the day that happened, then worked on it slowly for awhile. The demo version is on my soundcloud. How did you link up with Conor Rollins for the video? Conor approached me out of the blue saying he liked the song and felt inspired to make a video for it. I watched his Blackpool documentary and knew he'd be a great fit. I think he captured the complex emotion of the song perfectly. It’s been a pleasure working with him. Very talented guy. You’ve been involved in the music scene in Texas for a while now. How do you think that influenced this album? I've been making music and writing songs since 1997, and music has been the most consistent and reliable source of inspiration in my life. I think the biggest influence on this album is the desire to protect that inspiration. Part of that for me is avoiding any kind of scene or trend or noise. To finish this album, I moved down to the Texas coast where I feel inspired by the bleak and beautiful scenery. It also helps that I don't know anyone here and I can move around and observe anonymously. What do the coming months have in store? I'm finishing up my new album and the new Pure X album. I'm really excited about both. My new album is a deeper and more twisted version of Hard Sky, and the new Pure X album is going to be another departure from what we've done in the past. We're calling the feel/sound of the record so far "apocalypse rock". Check out the new clip for 'Hard Sky' above, and follow Jesse on Facebook to keep up with all his next projects.